Freckled Citizen: PSA: free books! I have to tell you guys about this awesome place I found. It's bursting with books inside, and they are free. And you can take them whenever you want, and bring them back when you're finished reading! And then the books aren't cluttering up your already-exploding bookshelves or gathering dust on every surface in your house! And if you don't have time to peruse the shelves of this magical place, you can surf their catalog online and place holds on any book you like, and they'll e-mail you when it's ready to be picked up via a short stroll from your home! And did I mention all the books are free? I know, right? I am blowing your minds right now. This magical place? It's called the library. Adorable! And second, there are always these hilarious neighborhood characters hanging out on the steps or inside at the computers. And there's that smell of books that doesn't recall your favorite bookstore but instead recalls something utilitarian and civic, like high school research before the internet was invented (not that that makes my heart sing in the nerdiest of ways or anything). I love the signage inside advertising the book groups that have adopted this library, and the childrens' section full of DC-themed books, and the feel-good small-town-ness of it all. My library rocks. When I got my DC library card last fall, it was the first one I'd had since I was a kid in my hometown. How is that possible? I'm not counting defacto cards in university settings, but the old school applying-for-a-library-card moment at the main desk. That moment rocks. It's not quite the cue-heartstrings moment that voting is, but it's up there. So why did I wait so long as an adult to join this free-book revolution? Don't be as lame as I was. Go support your public library! PPS: You can find me on Goodreads if you want to chat about books. Seriously. I constantly marvel at the wonder that is our public library. FREE BOOKS. It's just the best. Our library even has ebooks I can borrow and read on my iPad. And they deliver books to my front door. I appreciate these services oh so much as instead of "hilarious neighborhood charachters" we tend to have slightly frightening vagrants at our downtown library. It doesn't smell so much of books as it does a very dirty locker room... Still, I love the library! My misspelling of "characters" is taunting me. I must make note of it. Hooray for this PSA from a DCPL librarian! Ha! This reminds me of when I first moved to DC. I lived off Stanton Park and I was so in love with the Library of Congress I marched over there, sat in the reading room, and then tried to sign up for a library card. Except.... They don't let you check out books. WTF. (Unless you are a member of congress or staff). Instead I ended up a few blocks away from my apartment at the DCPL. It was old and smelly, but it was mine, and reserving books actually works if you are diligent. p.s., If you haven't yet been inside the LOC - totally bring some reading over there and spend a quiet afternoon drenched by sun and history that shines through the big windows. I love going to the library. Ah, it reminds me of being a little kid in the best possible way. I have a crush on the library too! !I hope you are having a good day!! I am also a sucker for the smell of books!! If my library looked like yours, I'd not only take books from it, but I'd take up residence in it. In all seriousness, I also had this library epiphany a few months back and am never going back to my old spendy book ways. Turns out Austin has a terrific public system as well, so my less saggy bookshelves and I are thrilled. I'm a little frustrated w/ the DCPL at the moment. 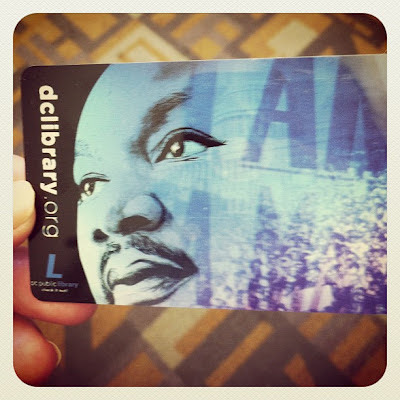 Like you, I finally got my library card a few weeks ago. My plan was to use the online ebook service for my Kindle, which I mentioned to the person on duty at our local branch. She told me I'd need to go onto the DCPL website and pay a dollar to register the card. Okey-dokey. Gah. Sorry for posting a whiny comment on such a positive post. I love libraries, I swear! The problem with my local library is that they have an awesome friends of the library bookstore, where the majority of the books cost a quarter. A quarter! So instead of checking out books, I just buy a bunch, read them and then re-donate them to the bookstore. I haven't checked out a book in months. Damn, I haven't felt that stupid in a long time. I'll feel less stupid when I finally trade in my old UPPL card for one corresponding to our "new" Dallas City address. 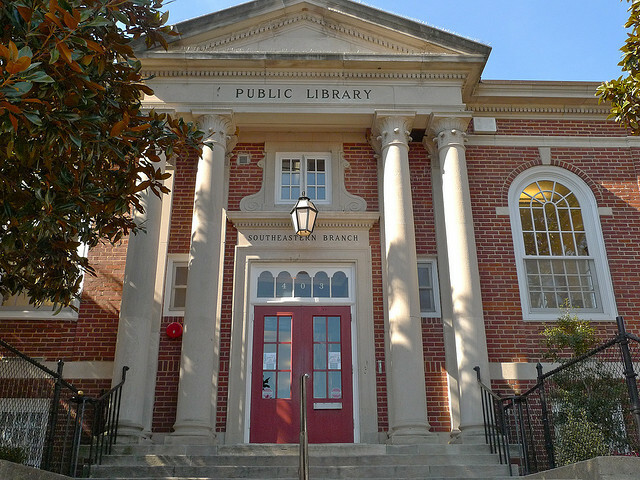 The White Rock Library looks pretty cute... although definitely not as cute as yours! I love the Southeast Neighborhood Library too! It's the size of my hometown library. Northeast one is also adorbs. I love that I can order books to be reserved for me there and they'll even call them in from other library locations.